The Counts of Salvatierra, Don Cayetano Martínez de Irujo (Duchess of Alba son) and doña Genoveva Casanova, annouced that they decided to separate. The first declarations of the Duchess of Alba on the matrimonial break of her son, Cayetano and Genoveva Casanova, reveal the appreciation that she has to her daughter-in-law. Cayetana Fitz-James Stuart when she is asked about the situation that the couple crosses, answered: "Momentarily" what it gives to understand in what she trusts in a near reconciliation. Alba's House commemorates the fifth centenary of the birth of the Great Duke of Alba, Fernando Álvarez of Toledo, an inconvinient and controversial figure that has given place to an endless number of false legends. On the occasion of this anniversary Don Jacobo Siruela, son of Dona Cayetana, has decided to re-edit the biography that William Maltby wrote on his forefather, " the most complete and veracious that exists " according to the duke. 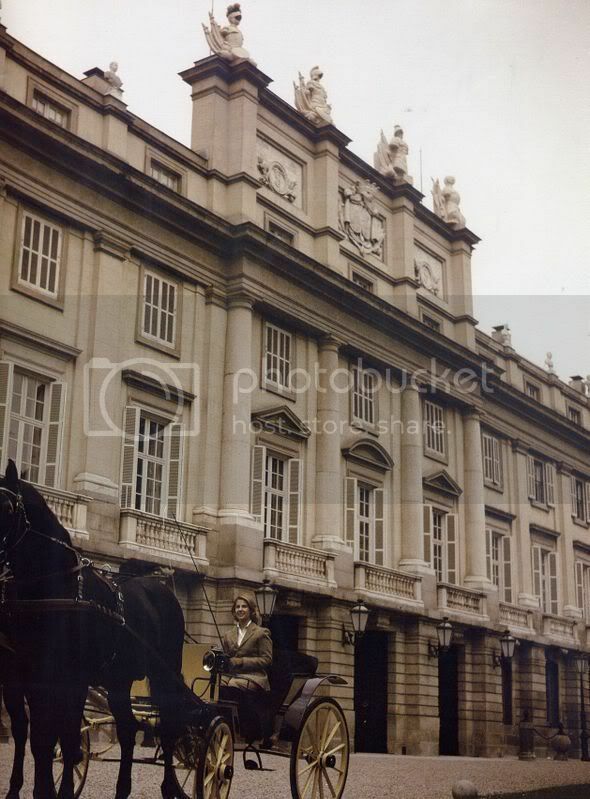 20 times Great of Spain, Maria del Rosario Cayetana Fitz-James Stuart y Silva known by the title of Duchess of Alba is, from the last 6th of September, the flaming Countess of Guimerà. The department of Justice has granted it to her to the death of the last Count, Carlos Caro Vázquez, with whom the Duchess of Alba competed for the title in 1969. Guimerà's county goes back year 1599 and though it does not have any practical utility, is a title still longed by the current aristocracy. The duchess of Alba visited today in Segovia a new establishment that there has opened her ex-daughter-in-law Maria Eugenia Fernandez of Castro and Fernandez-Shaw, dedicated to clothes, complements and objects of decoration of oriental style, close to the Cathedral. Genoveva Casanova in an act in honor of the bullfighter Enrique Ponce in Cordoba. With all their tax and other privileges (such as that of obtaining a diplomatic passport) having been abolished decades ago, the bearers of hereditary aristocratic titles are "limited to keeping alive the memory of a moment in our historic past," the government said in a 2006 legal bulletin. The bulletin was announcing a law ending one of the last aristocratic traditions: the first right of sons to inherit titles before daughters. "Aristocrats cannot even be distinguished for the quality of their education," he told the daily El Pais. The Duchess of Alba is present at the exhibition of wedding dresses in the Museum of the Suit. The Duchess has donated to the museum the dress of her first wedding. I think that Rafael de Medina is now dating a lady called Genevova de Casanova, is she related to the husband of Archduchess Monika, Don Luis de Casanova, Duke of Sanangelo. Genoveva Casanova is Mexican, and is separated from Cayetano Martínez de Irujo, Count of Salvatierra and son of the Duchess of Alba. She is a friend of Rafael Medina, at this moment, after her separation every man who approaches Genoveva is a supposed boyfriend, but for the present time nothing of nothing is of certainly in this history. At the age of 93 has died (Saturday, the 5th of January) in Madrid the marquise of Santa Cruz, Casilda Silva Bazán y Fernandez de Henestrosa. She was an affable and affectionate woman; with character and many personality; intelligent and clever; with a deep sense of the duty. In this aspect, Casilda Santa Cruz was an aristocrat in the fullness of the word. Heiress of ancient lineages, was taking up office as a natural obligation to serve from where she had touched her. Her life is marked by the service to her country, to the Monarchy and her house. Dª Eugenia Martinez de Arujo, Madrid, in 1976. 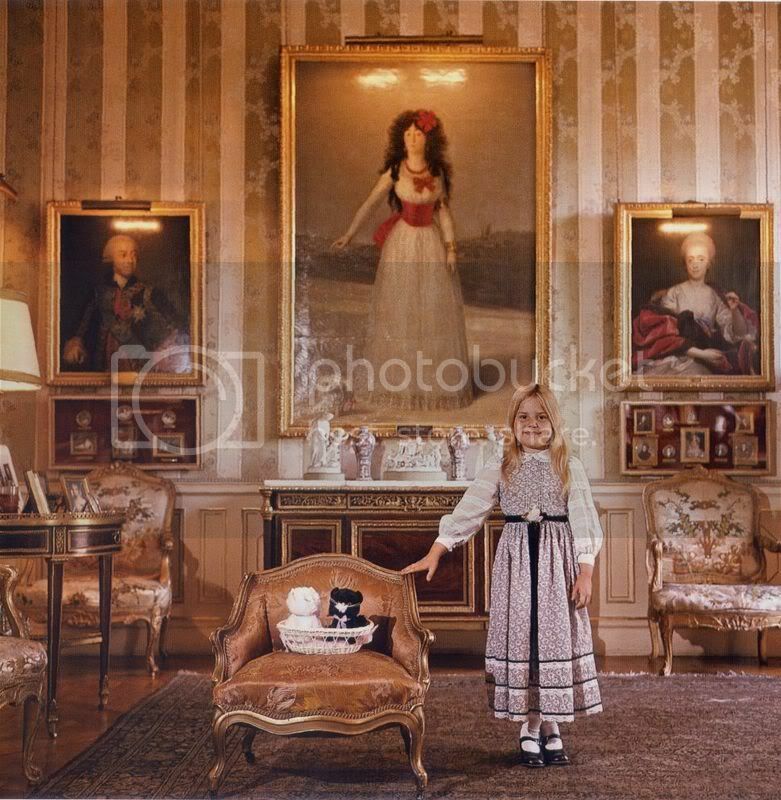 In this picture (scanned by me from the book Once upon a time by Slim Aarons; Abrams, publishers), the daughter of the 18th Duchess of Alba standing before Goya's portrait of the 13th Duchess of Alba. The funeral took place in Sanlúcar de Barrameda on Sunday for the Duchess of Medina Sidonia, Luisa Isabel Álvarez de Toledo y Maura, who died at the age of 71 on Friday. The local Town Hall called three days of official mourning and described her death as an ‘irreparable loss.’ An extraordinary council meeting is to take place to name the Duchess an adoptive daughter of Sanlúcar. So Leoncio Alonso is now HE 22 Duke de Medina Sidonia, 18 Marques de Villafranca del Bierzo, 19 Marques de los Velez and 3 times a Grandee of Spain and the head of the most importnt ducal house in Spain. The house has a status as a hereditaru title granted in 1445. Her only daughter is 16 Duchess de Fernandina. What about title for Gabriel Ernesto the youngest of the late Duchess child?